When the French and British colonists arrived in what is now Southern Indiana, thousands of bison were plodding through the wilderness from the grasslands of the Great Plains to the Falls of the Ohio. The large heavy beasts had created a pathway. Used for hundreds of years by the Indians, the path was very likely familiar to the French, who had founded a trading post at Vincennes in the early 1700’s, and who probably visited the mineral licks along the trace. 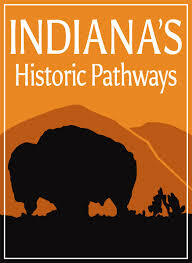 Known as the Buffalo or Vincennes Trace, the travel way was as durable as any road built today. Modern roads have been built along portions of its route and early pioneers used the Trace to cross the state. The Trace crossed into Kentucky at the Falls of the Ohio where the river was at its shallowest point. It stretched to the northwest to Vincennes and the Wabash where the buffalo dispersed to graze on the open prairies. The route was a blessing to early pioneers since it was said to be 12- 20 feet wide and worn through to a depth of 12 feet in many places. There were few areas of the country with travel routes which made passage so easy. Early settlers often booked passage on riverboats as far as the Falls (now the cities of Louisville and Clarksville), disembarked, and set off to the west along the Buffalo Trace. Once Indiana became a state in 1816, new roads were built, and they only occasionally followed the old route of the Buffalo Trace. Slowly, the trace fell into disuse and only vestiges can now be found of what had been the superhighway of the pioneer day. Today, a group of dedicated volunteers are researching this important piece of Indiana history. These pages include much of what they’ve learned.